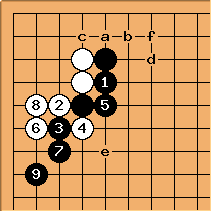 Alex Weldon: On IGS, with Black, I usually play the Manchurian Fuseki. Since it involves a 5-4 point, I need to know my 5-4 point joseki. But, I've discovered, my opponents, at the 6k* level, don't. But then, one time, I was playing against an opponent who played the 5-4 point, and instead of playing the press that I used to favor, or attaching at a, he attached on the outside, at b. I played what seemed intuitive for me, and it ended up with a very bad result. 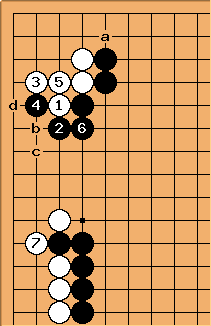 I checked Essential Joseki, and indeed, the play that was "intuitive" for me turns out not to be there, meaning that it's probably wrong (although Essential Joseki is, of course, far from being a complete listing of all joseki). Since the wrong play seemed, at first glance, to be sensible to me, I reasoned, perhaps it would seem to be reasonable to my opponents. And indeed, my opponents play the wrong move more than 50% of the time at the 6k* level, allowing me to reap unreasonable advantage by playing the outside attachment. Really, though, Black plays a two-step hane, trapping White in the corner. 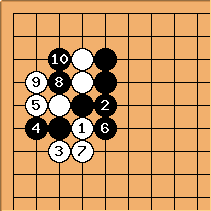 Even if White a, Black b, White c, Black d, White's corner is just 12 points, while Black's outside influence is considerable. 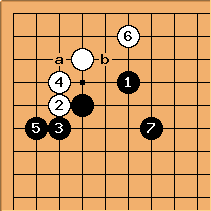 has some aji, but if White plays the hane and connect a and c, Black could always play d at e instead to remove that aji, in return for allowing White the possibility of an endgame clamp at f. Or, he could use to capture , at the expense of his left side influence. 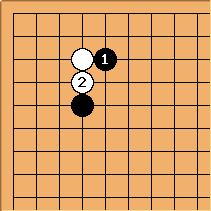 My opponents don't always even play this well, sometimes descending with at instead of cutting, in which case Black can play at , threatening a lethal cut one line above . 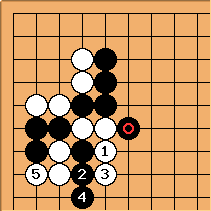 Next, Black will continue with a if he wants influence on the top side (giving White a ponnuki in the corner), or at b if he wants to exchange for the corner (giving White a ponnuki on the outside). There's more to this noseki. 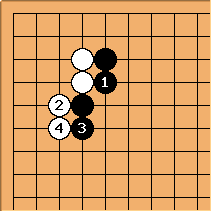 If White plays to to capture a stone, Black sets up two ladders (double threat ladder-maker). If the center ladder doesn't work, he sacrifices two stones and gets the better of it in terms of influence. 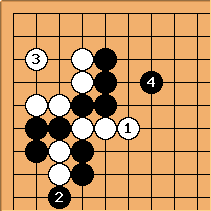 If White lures out her cutting stones, Black starts a ladder at and White has to defend at . 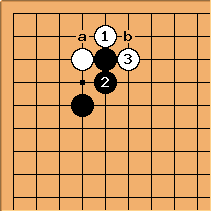 Normally, Black should not fear being cut this way, but if the surrounding area greatly favours White, he may also choose for the previous diagram. Checking my game collection, I found that this has actually been played a few times among professionals. 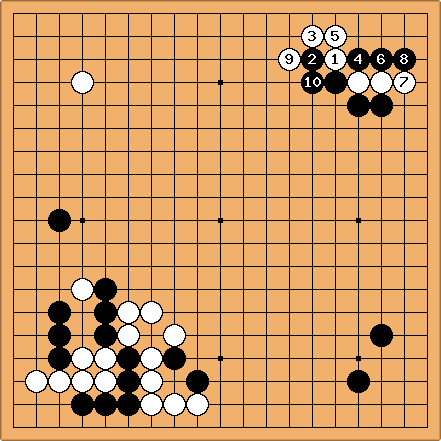 Out of over 20,000 games in the MasterGo database, the position occurs 182 times, of which is played 4 times (2%). 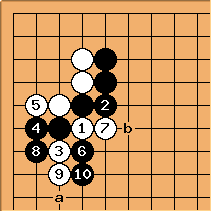 However, in all those cases White had some support down the left side and cut with here to start a fight. namely here as a ladder breaker, against . We are supposing is elsewhere takes/removes ladder. This follow-up with might be played a little later. Cho Chikun (W) - Kato Masao, Judan match 1988.